HAIR CARE. For keeping those long dark locks shiny, the Aztec girl applied a fine conditioner made from the oil of avocado stones, mixed with a bit of axin for added colour and shine. Axin is actually a greasy yellow substance produced by squashing an insect! CLEANLINESS. 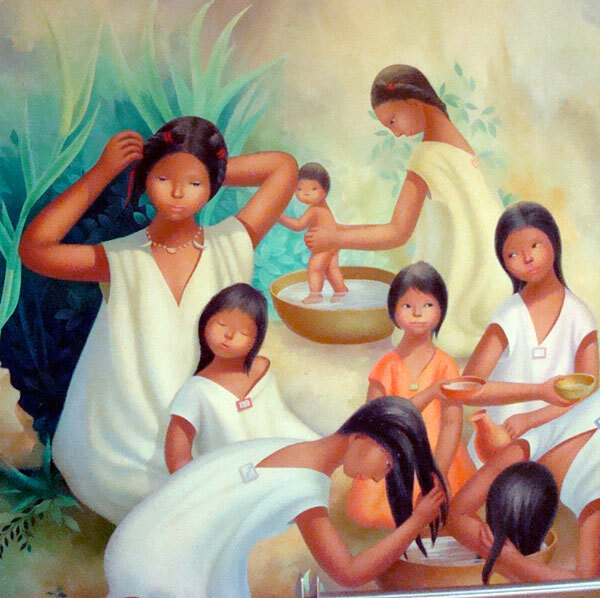 Instead of the bars of soap that we use, the Aztecs made use of two plants that have a natural soaping action, one for their skin and another for their clothes. SKINCARE. 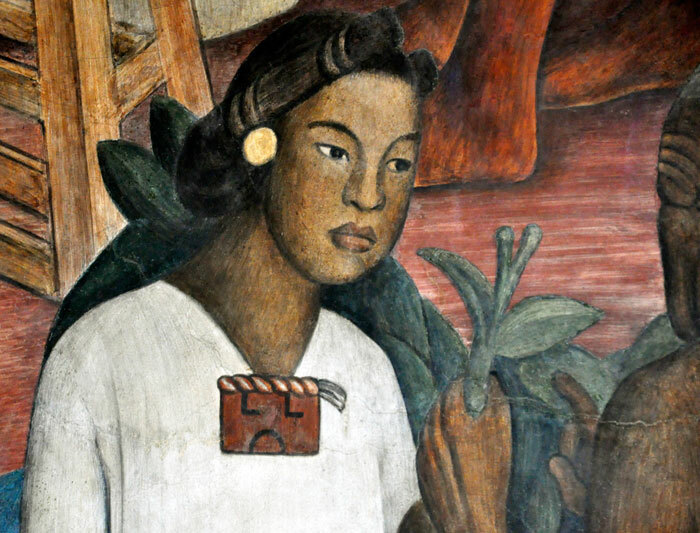 To keep the face looking soft and freckle-free, the Aztecs applied a watery preparation of senna (plant) and yarrow (herb) - plus a bit of pigeon poo...! LOOKING AFTER YOUR TEETH. 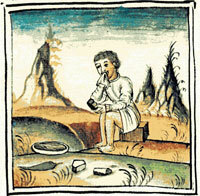 The Aztecs made their own toothpaste, out of a rather unpleasant-sounding mixture of roots, salt and chilli. And they rubbed their teeth with charcoal, much as we use toothbrushes today. Q. What did Aztec girls say to their friends who tried to encourage them to use bad habits? This delightful article has been generously written for us by Corrine Burns, Leicester School of Pharmacy, De Montfort University. You can read more of her work in our Aztec Health pages. (Please be aware that the recipes given here, whilst based on Aztec sources, are given here for information only and should NOT be attempted! Some plants contain poisonous chemicals, which can damage your health). The Aztecs were a pretty sophisticated bunch in many ways – not least in terms of personal hygiene and making the best of their appearance. 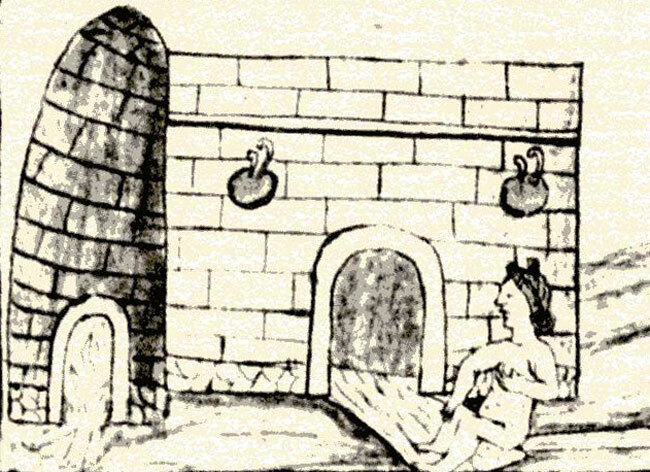 The Conquistador Bernal Diaz, in his diary, wrote that Montezuma himself was “...very neat and clean, and took a bath every afternoon”. Not so different from us, really. And, although the upper-class Aztec lady had a fine array of potions to work with, the Aztecs were definitely keen on the natural look. In fact, they looked down their noses at overly made-up women. Take the auianime, or Aztec courtesans, for example. They were described by one Aztec chap in these faintly disapproving tones: “She [the courtesan] makes up her face with a yellow cream called axin, which gives her a dazzling complexion; and being a loose, lost woman, she puts on rouge. She also has the habit of dying her teeth with cochineal and wearing her hair loose”. So, as a good Aztec girl, what’s the best way to maintain your good looks – and how can you avoid going about looking like a shameless courtesan? 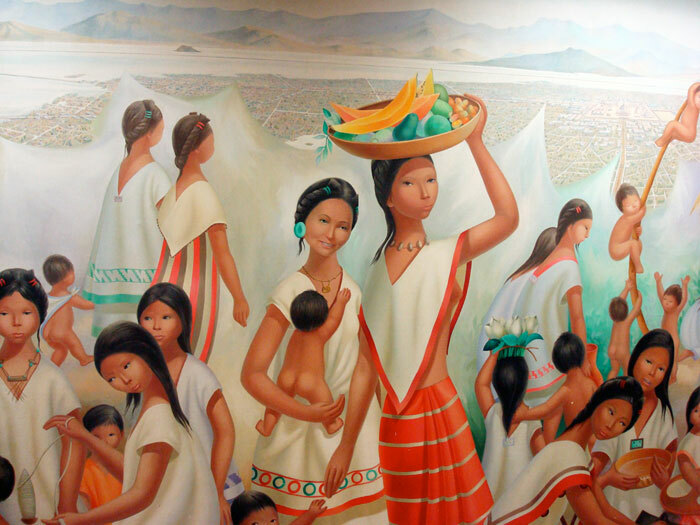 Well, heed this advice from a good Aztec dad: “Listen to me, child...make-up and paint are things that light women use – shameless creatures. If you want your husband to love you, dress well, wash yourself and wash your clothes”. 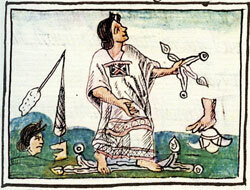 So, bearing that sage advice in mind, let’s take a look at the Aztec girl’s beauty regime. If you fancied a darker tint, then you would get hold of some black clay, and mix it with the powdered bark of uixachin (or, as we know it, Acacia farnesiana). 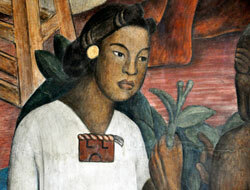 Uixachin may have produced a dark tone on the hair because it contains chemicals called tannins. When tannins are mixed with iron, dark dyes are produced –something that we take advantage of today when we’re dyeing leather. It’s guesswork, but it may be that the “black clay” that was used for this Aztec hair dye was black because it contained lots of iron. Now, what if you had a bit of dandruff? No need to worry: the Aztec pharmacy had something for that. They used the berries of yiamolli - Phytolacca species, colloquially known as pokeberry or pokeweed. This is a plant that grows all over North and Central America, but it is pretty toxic! Instead of the bars of soap that we use, the Aztecs made use of two plants that have a natural soaping action. 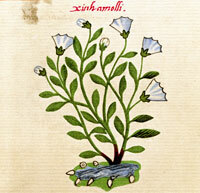 To wash their skin, they’d use xiuhamolli, or Saponaria americana. This contains chemicals called saponins, which dissolve grease because they act as detergents. And, according to Francesco Saverio Clavigero in the History of Mexico (available free online at Google Books), there was even a species of xiuhamolli that could be used to dye the hair gold (just in case you didn’t fancy using axin). 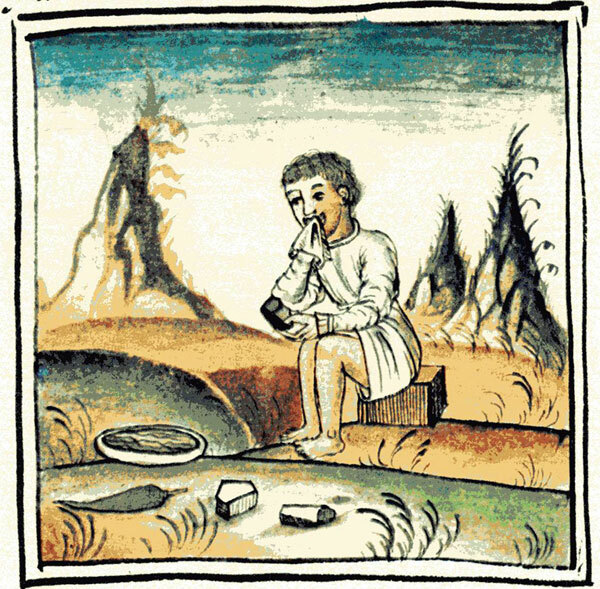 To wash their clothes, the Aztecs used a plant called copalxocotl, or Cyrtocarpa procera. The Spanish called this plant the “soap-bead tree”, and were very impressed with its effectiveness. 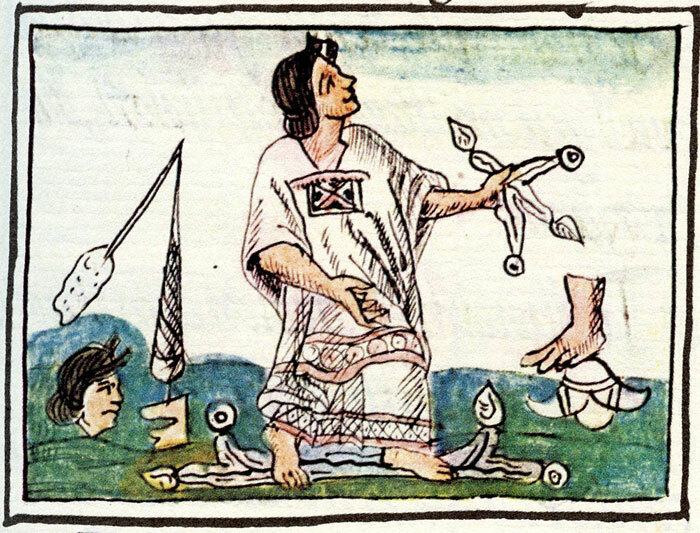 Hernandez wrote that the Aztecs: “...throw the fruit [of the soap-bead tree] into hot water, and with that they soap their clothing as much as real soap”. To keep the face looking soft and freckle-free, the Aztecs applied a watery preparation of ecapatli (Cassia occidentalis, a type of senna) and tlalquequetzal, a type of yarrow. 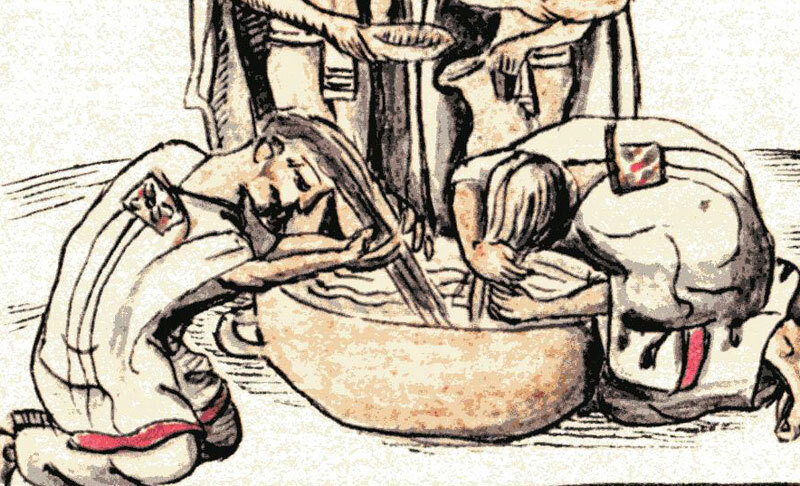 That sounds like quite a nice way to wash your face – except that the original Aztec recipe also says to chuck in a bit of pigeon excrement! Perhaps not. And, although the Aztecs weren’t big fans of make-up, they were known to brighten their skin with a bit of axin – that insect paste again! – or a dash of a yellow earth called tecozauitl. The Aztecs made their own toothpaste, out of a rather unpleasant-sounding mixture of tlatlauhcapatli (Geranium, to us) roots, salt and chilli. Of these ingredients, salt was probably the most useful in terms of keeping the mouth clean, because it helps to draw infections from the gums (in fact, you many have had your dentist advise you to use a dilute salt solution if you have a sore throat or infected gums). You could also have used some iztauhyatl (a type of wormwood, known to us as Artemisia mexicana), or rubbed your teeth with charcoal. Charcoal would have helped keep your teeth clean by acting as an abrasive, rather like our toothbrushes. If your gums are really in a bad way, then try making up a mixture of egg yolk and white honey, and add the seeds and roots of a nettle. So, what not to do? Well, some women had a habit of staining their teeth dark red with cochineal – a red colour extracted by crushing the poor old Dactylopius coccus beetle - but this was more a habit of the Otomi and Huaxtecs, and not so much of those classy Aztecs – although Jacques Soustelle writes that “...some Mexican women had taken to it”. Talking of Otomis, they were also quite keen on their tattoos, but, again, this wasn’t something the Aztecs really approved of. As far as Montezuma and his people were concerned, the natural and clean look really was the way to go! And who could disagree with that? For more information, have a look around the rest of the Aztecs at Mexicolore website. There’s also quite a lot of information about day-to-day Aztec living in Jacques Soustelle’s Daily Life of the Aztecs, in William Gates’ Aztec Herbal, and in Book 11 of Friar Sahagún’s Florentine Codex. • Pic 5: scanned from our own copy of The Badianus Manuscript (Codex Barberini, Latin 241), John Hopkins Press, Baltimore, 1940. Very informative, thanks so much for such a great article. We could certainly learn from the Aztecs today! Many of the medicinal plants mentioned (yarrow and saponaria) were also used for these cosmetic purposes in Europe in the olden times as well.